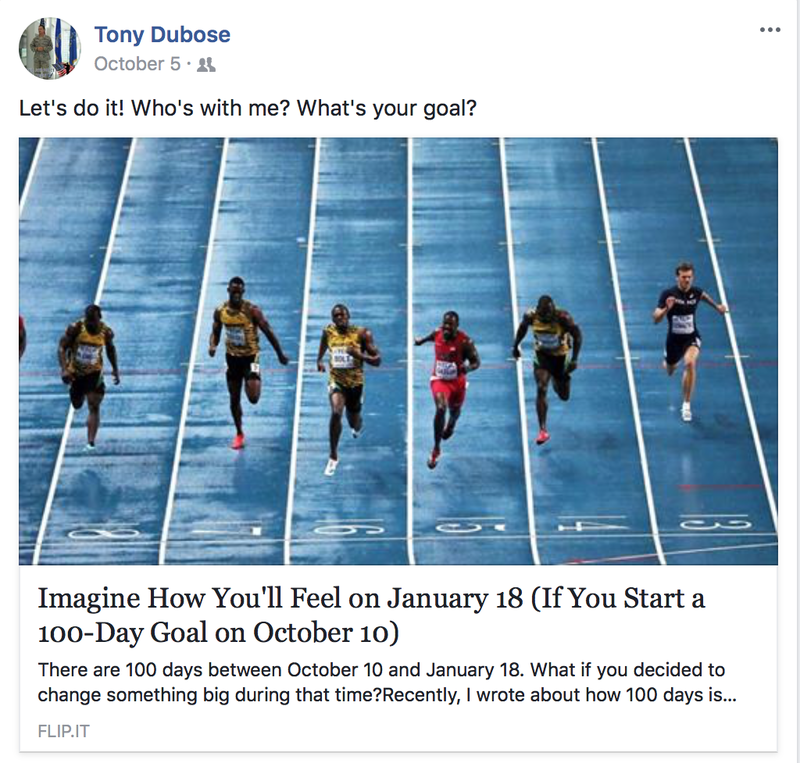 On October 5 my friend Tony Dubose posted a link on his FB timeline. The header? "Imagine How You'll Feel on January 18 (If You Start a 100-Day Challenge on October 10)". There are 100 days between October 10 and January 18. What if you decided to change something big during that time? The idea is simple. 100 days is long enough to accomplish something big, but short enough to discourage procrastination. And I have things I want to accomplish! I decided to focus on one thing – increasing my chances of success by decreasing my tendency to get discouraged when I try to do too much at once. And the thing I have really felt has been missing from my life? Running. It's weird – when we started running all those years ago, it took me a while to feel like a "Real Runner". But then I embraced it. It became part of who I was. Oddly enough, when I went to work for a running shoe company, I felt LESS like a "Real Runner" – I felt like I wasn't fast enough to be legitimate, a feeling reinforced by some of my colleagues who would say things like "Oprah didn't RUN a marathon… she COMPLETED a marathon. Anyone who takes that long to finish isn't RUNNING." Mind you, Oprah famously ran the 1994 Marine Corps Marathon in 4 hours, 29 minutes … a good hour faster than I've ever run a marathon. It didn't *stop* me from running – hell, I ran a lot of half marathons during my time there – but it definitely made me feel like I wasn't a Real Runner. And then when I left the running company – when I thought I would be able to re-gain my runner self – I hurt my hip. Not running, amusingly enough – in an overeager attempt to do squats and lunges at boot camp. With the Kilimanjaro climb looming I decided to stop running and just do my PT exercises and walk and hike to train. I didn't want to hurt my hip and risk being able to climb at all. But now that we're back I really wanted to get back to running – to being more active every day, not just when hiking. So the 100-day challenge is perfect. 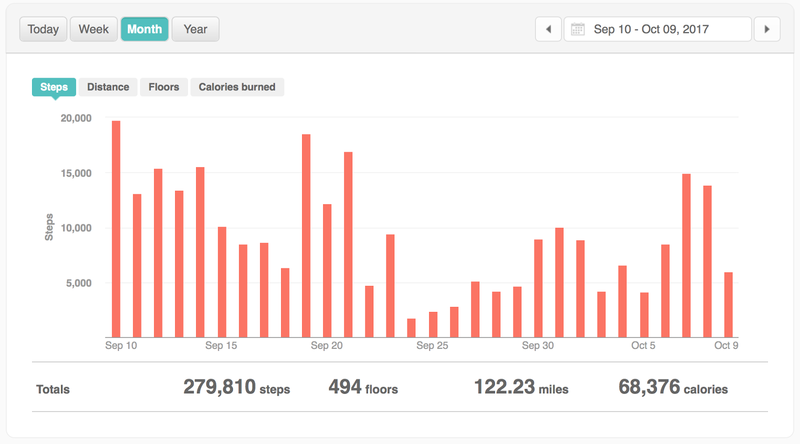 I set as my 100-day goal to be able to run for an hour, without stopping, at the end of 100 days. Note that it's not a distance goal -- it's a time goal. As part of the goal, I decided to spend the first weeks following the NHS Couch to 5K program. And then, when that ends after 9 weeks, and I am running for 30 minutes nonstop, I'll just keep building slowly by adding 2 or 3 minutes of running to each run. I feel good about this goal. HOWEVER, because I'm being very sensitive to my gimpy, old-lady knee, I wanted to have a backup goal. 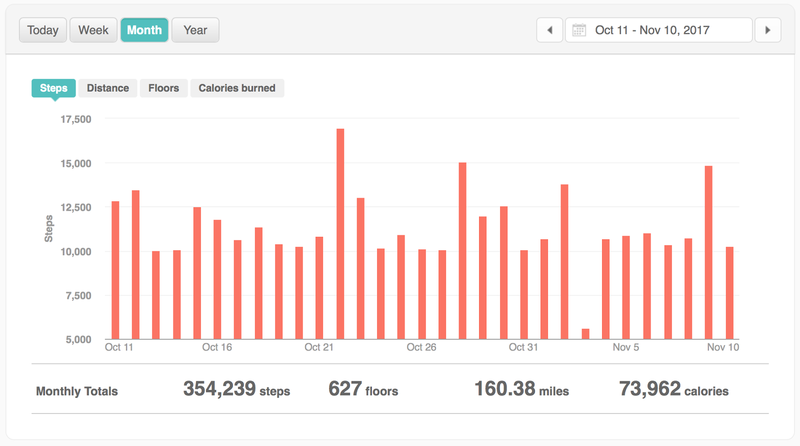 If I had to stop running because I got hurt, I would at least make sure that I got 10,000 steps per day for 96 out of the 100 days. This was, in many ways, the more ambitious goal: since going back to work I rarely get my steps in. I have become weirdly sedentary. In fact, I looked back and in the weeks leading up to the challenge I only hit my step goals once or twice per week, usually on the weekend. Grim. It doesn't look too bad in the early part of that month ... until one remembers that we were on vacation in Africa until September 21. Thursday 11/9 was the first milestone day -- 30 days into the challenge. I had set my milestone goals as follows: having completed run 2 of week 5 of the Couch to 5K program, and having hit my steps 29 out of 30 days. I'm super pleased to say that I have done both! Yeah, there's one day where I didn't come close: November 3. But I felt like it was a conscious decision that day not to push it, and I was okay with that. 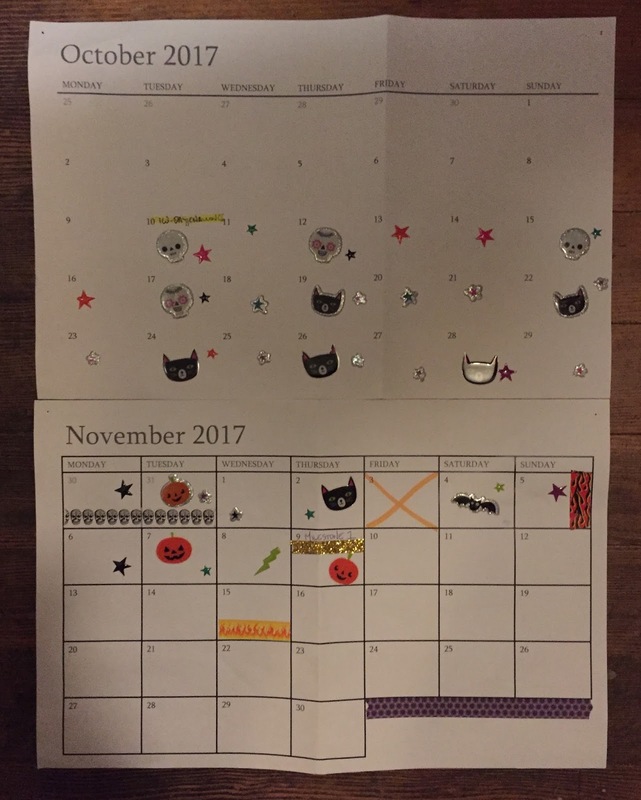 Big stickers = runs; small stickers = hitting my step goal. You amaze me with your enthusiasm and determination!